It was only after President Ahmadinejad that we became grateful for what we had, like, for example, ice water. Hi guys. How are you? Accept my condolences on the ending of President Obama’s presidency. I’m sorry that I must also send my condolences that it’s the beginning of President Trump’s era. It’s as if spring has immediately been replaced by winter. Or as if you’re in the passenger seat of a Ferrari, the driver suddenly falls asleep, the car goes crashing in a valley; then you are brought out of the Ferrari, escorted to a horse-drawn carriage whose coachman is one who has just gotten his license. But don’t worry. I totally feel for you. My country’s president during the Eight Years Reform era was a Ferrari driver and we had so much fun. Then, well, for the eight years after him, we rode in a carriage and I really need to thank the president who rode in that carriage, because at the end of his term, he turned the rules of physics upside down and set new Guinness World Records. You ask how? This is how: he rode the carriage forward but we kept going backward. If Einstein were alive, he would probably die of a stroke trying to solve that problem. Anyway, don’t be too worried. This President Trump of yours will make you want to emigrate. This will be very good for you, because until now you have always seen immigrants but never been immigrants yourselves. 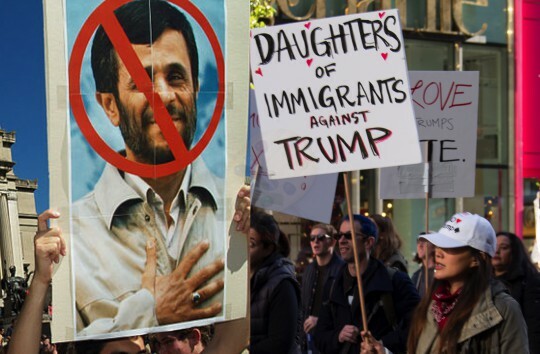 We Iranians have widely emigrated to the U.S. ourselves. So you are more than welcome here; if you have it too hard, move here. Whatever the conditions are here, they are better than being known with Trump after Obama. Think about it: so far, we Iranians have imagined American life to be like the film The Matrix; it is truly a pity to see it as American Pie now, or something even stupider than that. Can you believe it? Under President Ahmadinejad, we sympathized with Japan when the atomic bomb dropped on Hiroshima. Since the inauguration of President Trump, perhaps you have been sympathizing with the universe during the Big Bang. But be glad, because Mr. Trump is going to make you all grateful later. It was only after President Ahmadinejad that we became grateful for what we had, like, for example, ice water. No pill is going to cure your headache when you are furious about your president’s speeches; you’d do better to take an ice-cold shower and try to forget. Believe me, there is no reason to panic. These days the medical field has improved a lot, and it can cure any cancerous tumor, even President Trump. That said, one needs to be fair. President Trump might have a thousand and one vices, but he will have one great virtue. Rest assured that no matter how bad President Trump’s time in office is for everyone, it is going to be amazing for your satirists. They will have so much material they’ll be able to export half of it outside the U.S. But President Trump has another virtue, as well: You will become so anxious that you will stop gaining weight. The Iranian people were each sixty-three kilos overweight, on average, before President Ahmadinejad. You won’t believe it, but by the day he left office, not only had we lost the extra weight, we almost disappeared. And if you get really lucky, your country will lose its extra weight, too. Our country was, for example, several thousand billions of rials and dollars thinner, and a few oil towers and gold bullion and foreign currency trailers lighter. The nation even lost millions of tons of its weight as a result of the decimation of buildings, forests, and lakes. By the way, President Trump’s slogans are similar to President Ahmadinejad’s in that he keeps making promises to workers. I suggest that, no matter what your job, always hide a thousand dollars under your pillow, because these politicians, whenever they say they want to do a good job and benefit us, the first thing they do is take our jobs from us. Truth is, if I were you, I would exchange all my dollars to rials. Why? Because if President Trump does to your economy what President Ahmadinejad did to ours, you will suddenly find yourselves able to buy only one can of Pepsi with one thousand dollars. Also, why are you so troubled by President Trump’s anti-women talk? You should not forget President Clinton, who cheated on his wife and, of course, on you, while in the White House. Psychologists believe that people who appear to be nice are more likely to do bad things in their own homes and in the White House. Let’s hope that President Trump is all talk and no action. If President Clinton, who did not talk of such things at all, carried such acts, imagine what President Trump, who already talks of them, could do; if he is to act, you need to worry about the White House’s female cats and birds. Anyway, as Americans would say, God bless you. And, as Iranians would say, God bestow upon you real patience. Translated from the Persian by Poupeh Missaghi. This piece was originally published in Persian in two installments in Shargh newspaper on January 22nd and 23rd, 2017. Pouria Alami is a thirty-five-year-old satirist, journalist, and writer, based in Tehran, Iran. He has a daily sociopolitical satire column in Shargh newspaper, the largest independent newspaper in the country. He is the author of eleven books and teaches journalism, satire, and creative writing, as extracurricular classes in various universities. His work has also appeared in English in World Literature Today.